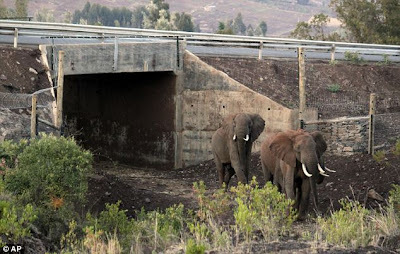 Maximizing Progress: Elephant Underpass ~ Kenyan Wildlife Corridor! "When is a tunnel not a tunnel? When it's a trunk road. This tunnel, which connects two wilderness areas in Kenya, has just opened and here for the first time elephants have been spotted using it. It was 6.47pm when the set of gleaming set of white tusks poked out of the underpass. There then followed another pair and then another as three young males moved cautiously through before climbing a bank of dirt, made a sharp left turn and crashed into the forest. The $250,000 tunnel is heralded as a breakthrough in human-animal relations. It was built with donor funds with the aim of uniting two distinct elephant populations separated for years by a road. [...] It was lined with hay and elephant dung to entice the animals through. The elephants successfully crossed a major road without putting themselves or motorists in danger, and without damaging crops or scaring residents in a nearby village."